When he turned 7-years-old, Joseph Gordon-Levitt landed his first role in television film Stranger On My Land, starring opposite Tommy Lee Jones. In the years that followed, he enjoyed limited, yet sustained success with roles in such well-known TV series’ as Murder, She Wrote, Dark Shadows and Quantum Leap, building up a strong portfolio and an honest passion for his art. It was his role as the awkward, yet unchaste Tommy Solomons in 3rd Rock From The Sun, however, that awarded him his first real break. The series, about a family of aliens on a research expedition to Earth, ran for six seasons from 1996 – 2001, and introduced a new star to the world. From there, instead of opting for the blockbuster route and immediately becoming a Hollywood A-lister like many had estimated, Gordon-Levitt went on to star in a host of independent films. The first of which was Mysterious Skin, a somewhat controversial film about a teenage hustler who, when tracked down by an alien-obsessed friend from his childhood, is forced to come to terms with his unholy past and troubled present. Under Gregg Araki’s direction, a film-maker synonymous with queer cinema, Gordon-Levitt handled the opportunity with a commendable delicacy and expertise, undercutting the harsh subject-matter with a vulnerability that both captivated and bewitched. His next film, Brick, signalled the start of an important relationship with writer-director Rian Johnson. Here, Gordon-Levitt played Brendan, a high school loner who must work his way through an organised crime ring to reach ringleader and powerful drug dealer The Pin in order to uncover the truth behind the death of his former girlfriend Emily. Adopting a razor-sharp, dark and off-kilter approach, Johnson made a remarkable impression with his writing and directorial debut. It was Gordon-Levitt’s biting, self-assured and two-edged performance, though, that solidified Brick’s position as one of the best films of 2005. With a host of award nominations already under his belt, Gordon-Levitt’s choosy attitude paid of, and he followed his two critically acclaimed breakthrough performances with indifferent roles in Havoc, Shadowboxer, The Lookout, Stop-Loss and Killshot. Then, in 2009, (500) Days Of Summer premiered at the Sundance Film Festival to rapturous applause, and Gordon-Levitt once more found himself the talk of the town. Marc Webb’s off-key and unconventional film flitted between the past and the present as the relationship between Gordon-Levitt’s headstrong Tom and Zooey Deschanel’s quirky, independent Summer offered a new take on the all-too familiar romantic comedy formula. Gordon-Levitt shared impeccable chemistry with Deschanel, and his Tom was a character who, despite knowing exactly what he wanted from life, couldn’t help but become wrapped up in the unset, unknowing and free-wheeling Summer. It was a film that wore its heart on its sleeve and showed a brand new, almost revitalising side to Gordon-Levitt – an actor with incredible star presence who can also switch between a range of emotions at the drop of a hat, all the while keeping his cool and charming the pants off anyone willing to surrender themselves. The subsequent years saw Gordon-Levitt continue to effortlessly shift between the independent and the blockbuster ends of the Hollywood spectrum, achieving both highs (Inception and 50/50) and lows (G.I. Joe: The Rise Of Cobra). This year, however, has perhaps been his best yet. He’s already entertained critics and audiences alike with roles in The Dark Knight Rises, which saw him reteam with Inception director Christopher Nolan, and Premium Rush, and he still has Steven Spielberg’s Lincoln to come before year’s end. Before that though, and before he steps behind the camera for his directorial debut Don Jon’s Addiction, he has arguably his best film since Mysterious Skin and Brick coming out next week: Looper, a sci-fi thriller come well-honed character driven and moralistic drama. Written and directed by Brick collaborator Johnson, and co-starring Bruce Willis, Emily Blunt and Jeff Daniels, the film centers on a contract killer responsible for killing and disposing of those sent back from the future. However, when he’s ordered to kill his older self, he chokes and sends himself on a path of abdication. It’s a film that, while perhaps a little too improbable for some, is quick in pace, clever in style, awe-inspiring in nature, and packed with wit, action and a top-notch performances from its faultless supporting cast. More than that, however, it’s a film that harbours one of Gordon-Levitt’s best performances of all time, and even has the potential to bring him closer to awards glory than he’s ever been before. And, even if he doesn’t find acceptance from those knowingly stubborn awards voters, he has the winning combination of charm, enthusiasm and earnest naivety to ensure he’ll be around for many, many more years to come. 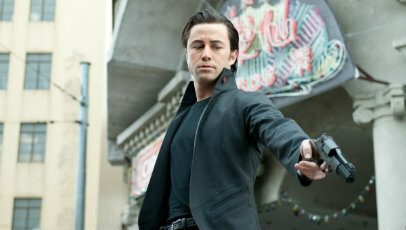 Looper hits U.K. cinemas nationwide on September 28. Read our review here.